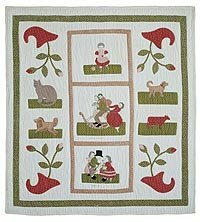 This is a sweet little crib-size quilt (35" x 37") with charming appliqués that depict special “scenes of childhood.” The adorable inked hands and faces bring the scenes to life and add lovability to the vignettes. Under each scene is a descriptive phrase inked in the original handwriting of the quilter (presumably!). The borders are scattered with simple coloring book type animals – a cat, dogs and a cow and colorful cornucopias grace the corners. The pattern includes close-up color pictures of each scene to enable a close-up view of the embroidered and fabric details. In addition, placement diagrams are given for each vignette, along with a descriptive page of embroidery stitches for the clothing details, freezer paper templates for the scenes, a stencil to mark the larger appliqués and also the quilting stencil. As with all the patterns, both hand and machine instructions are given and historical information is also documented. Not only is this a heartwarming quilt to make, but would be a very special quilt for a very special gift, for a VERY special person!